Jonathan and I REALLY loved Moscow, and you know, I didn’t think I would ever actually be saying that. When we first mentioned to friends and family, that we were going to Russia, everyone raved about St Petersburg. All those that had been to St Petersburg loved it, and if they hadn’t been, well they said it was on their bucket list, and now having seen Saint Petersburg for ourselves, we can certainly see why. Even with all the positive reviews, we had heard about the city, it still exceeded our expectations. If you are wondering what to see in Moscow, here are our favorites! Our Saint Petersburg, Russia Tour! But Moscow was different. ‘Well, once you’ve seen Red Square, what else are you going to do?’ ‘It’s just a big city, why are you going there?’ I have to confess that I too had some doubts about visiting Moscow. Why? 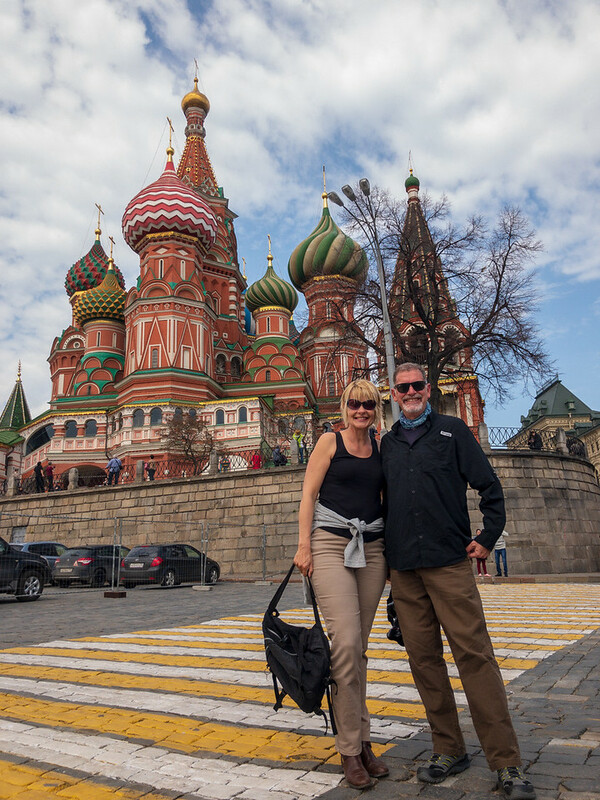 Well, I went there in the late 80’s, and while it was great to be standing in Red Square, and see the Kremlin and St Basils Cathedral (spoiler alert- it still is! ), Moscow was, well, just grey. The weather was grey, the buildings were grey, the people looked grey and the food, yes even the food was grey. Even now, I can still see in my mind the long queues of depressed looking Russians lining up for the GUM department store with its empty shelves and the long lines of miserable looking people lining up to see Lenin’s Mausoleum. ‘It’s changed, you have to come and visit!’ said Alina from Strelka Travel. ‘Hmm,’ I thought, people said that about Berlin too, but I still wasn’t impressed after revisiting Berlin in March of this year – sorry Berlin! But Moscow has changed, wow has it changed! No longer the ugly duckling but a beautiful swan! The city has been undergoing gentrification for quite a while now. From a visitor’s point of view, it looks terrific. The Russian people we met were welcoming, the food was delicious and far more choice than what we are used to here in our home in Portugal. Don’t come to Russia if you are hoping to lose weight. 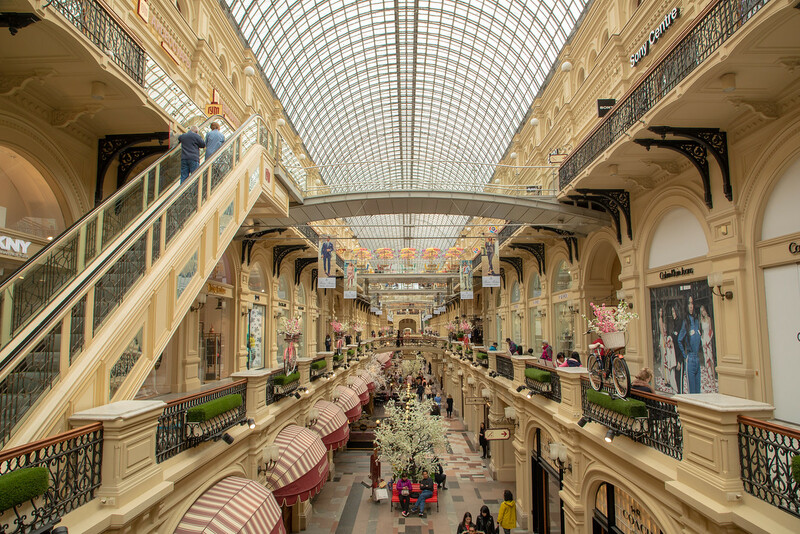 I could easily ramble on for hours about how lovely Moscow is and what to see, but to make it easier, we have created a list of what to see in Moscow and what to do on your visit to Russia’s capital city. We spent four days there and would happily have stayed longer. 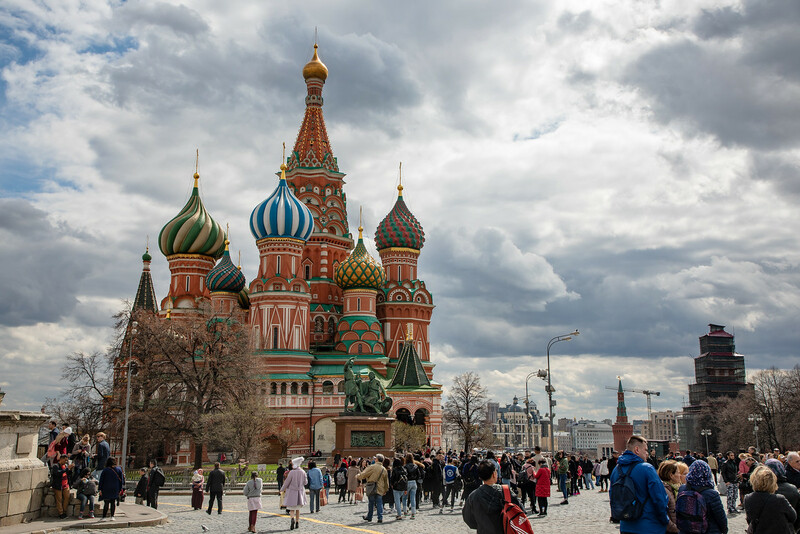 If you are wondering what to do in Moscow, here’s what we did and loved. This stunning iconic building, located on Red Square is known to everyone as St Basil’s, but it’s officially called “The Cathedral of the Intercession of the Virgin by the Moat.” However, everyone refers to it as St Basil’s after Basil the Blessed, a Russian Orthodox Saint known as a holy fool, who was buried on this site when it was the Trinity Cathedral. Not quite sure why he was known as a holy fool, sounds intriguing! The Cathedral was built in the 16th century under the orders of Ivan the Terrible. These days, the Cathedral serves as a museum. Daily from 11.00 to 17.00, Closed on Tuesdays. For a while apparently during Soviet times, there was talk of demolishing St. Basil’s Cathedral because it hindered Stalin’s plans for hosting huge parades on Red Square. In fact, St Basil’s was saved thanks to the bravery of architect Pyotr Baranovsky. When he was ordered to prepare the building for demolition, he refused and allegedly told Stalin, he would rather kill himself then destroy the Cathedral. So thanks to him, St Basil’s Cathedral still remains, however, Baranovsky did end up with five years in prison. Moscow’s Kremlin has played an important role in Russian life for more than 800 years. Getting tickets to visit the Kremlin can sometimes be a little time consuming, so that’s where having the help of an agency like Strelka Travel comes in handy. You’ll need a good few hours to explore the grounds and Cathedral Square. The Kremlin was initially built in the 12th century and has grown over the centuries under different leadership. It served as a fortress for the city under Ivan the Great and Ivan the Terrible. Lenin and Stalin issued their orders from here, and today it serves as the office of the Russian President. The area is vast, and many of the buildings are unsurprisingly inaccessible for tourists. 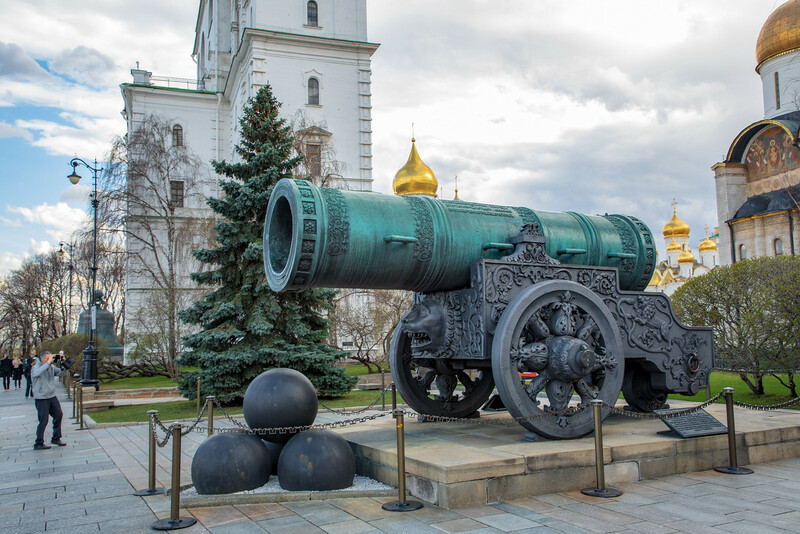 Wandering the extensive grounds of the Kremlin, you will come across the vast Tsar Bell – the biggest bell in the world that never rang and Tsar Cannon, the largest cannon that never fired! 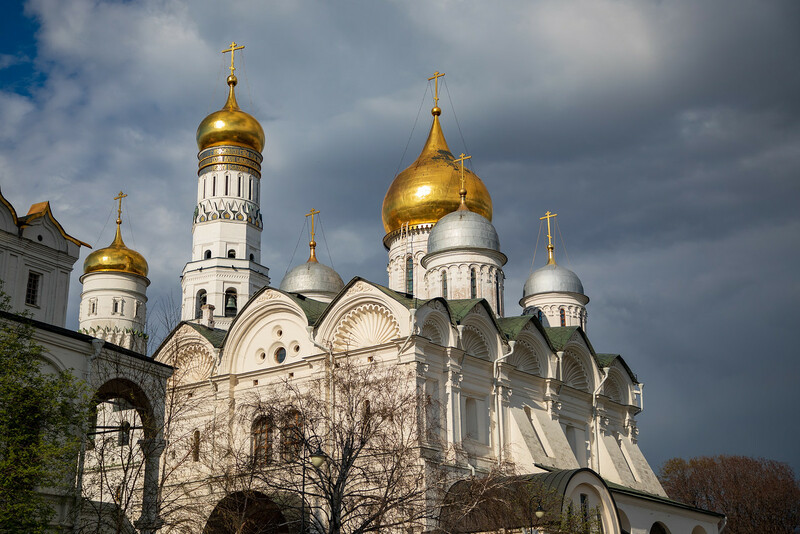 Located in the very centre of the Kremlin is the impressive Cathedral Square with five beautiful churches with their stunning gold onion domes. It is possible to visit all the churches, but we opted to visit the main cathedral, the Cathedral of the Assumption. The religious artworks in the Russian churches are incredible. In this cathedral, there was also a very ornate praying throne for the Tsars, initially built for Ivan the Terrible in 1551. One of the first city parks in Moscow. It is situated along the length of the western Kremlin Wall. It’s a nice place to chill after visiting the Kremlin. Here, you can enjoy coffee, ice creams, and people-watching. Located on Red Square opposite the Mausoleum. This place has changed beyond recognition since I last visited back in the late 80’s. From empty shelves of yesteryear, now it is filled with designer stores and world-famous brands. This store is somewhat out of our price bracket, but it’s fun to have a look inside, as the building itself is lovely, and there are quite a few interesting relics from the past that are fun to look at on the upper floors. It is not how I imagined Moscow to be at all, but there are some excellent little eateries and clean toilets inside. Opening hours GUM is open daily from 10 am to 10 pm. The streets next to GUM that lead off from Red Square are great to wander around too. They are decorated with pretty lights and butterflies, fake sakura which looks a lot better than it sounds, and perfect for taking those selfies. Here you will come across street entertainers, opera singers, and locals dressed in historical costumes posing for photos. There are cafes to people watch, ice cream parlors, cutesie restaurants. It’s fun, it’s alive, it is so not the drab grey Moscow I remember at all. 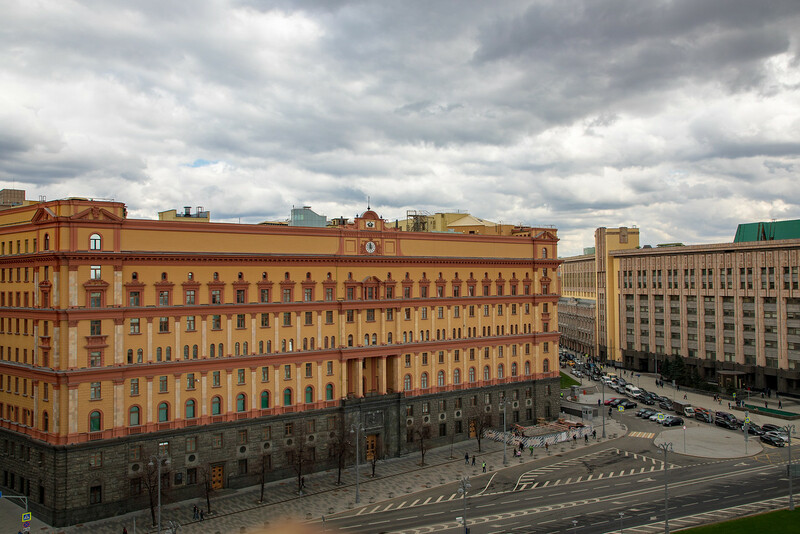 Within walking distance of Red Square, you will come across the rather imposing yellow, grey and red stone Lubyanka building – the former headquarters of the KGB and at one time probably the most feared building in Russia. There’s even a prison inside. Apparently, in Soviet times, the citizens were too nervous to even look at the building. Now it’s a cool building to take a photo of, well it’s KGB! Today, the KGB has been replaced by the FSB which is kind of same, same but different. Top Tip: Just a few minutes walk from the former KGB building is the Detskiy Mir department store for children. There are some interesting shops in there if you have kids but that’s not why we are there. 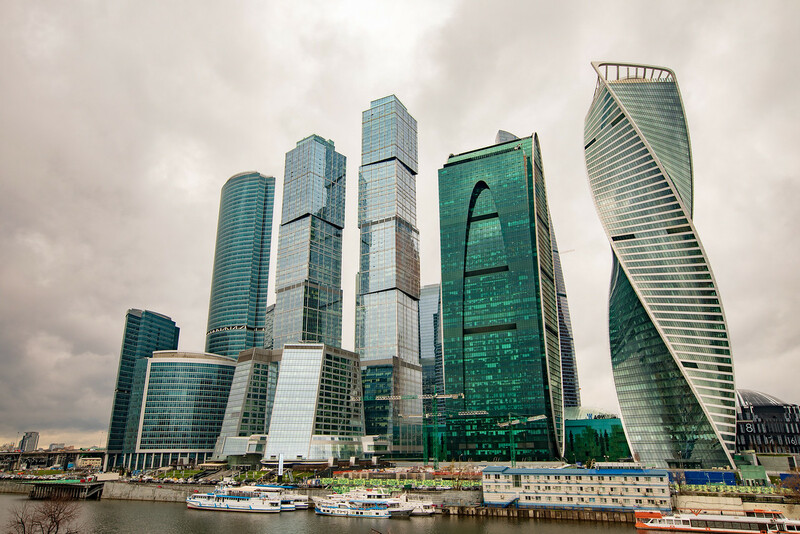 Head up to the observation deck for some excellent views of the city, the KGB building – you can even see the Kremlin and on a bright day the Moscow State University, one of Stalin’s seven sister buildings. It also has a coffee shop up on the rooftop too. The wedding cake style giant skyscrapers are a distinct feature of the Moscow skyline. Built by Stalin after World WarII to rival the towers in the USA. 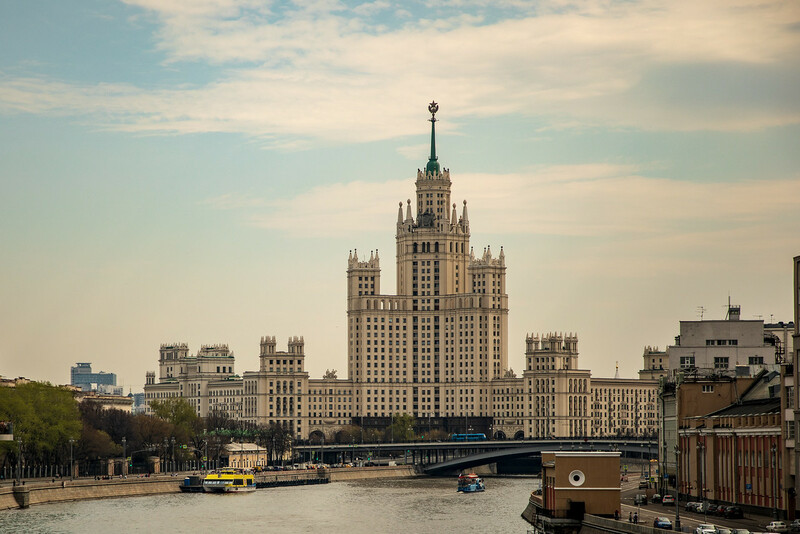 One of the smaller sisters is now the Hilton Moscow Leningradskaya Hotel located just a few minutes walk from the Leningradsky Station where we disembarked from our night train on the Red Arrow from St Petersburg. Keen to look inside and feeling slightly peckish, our guides from Strelka Travel took us there for a rather lovely buffet style breakfast. The interior of the hotel is an unusual mix of Russian Orthodox, Gothic and Baroque architecture and is home to the longest bronze chandelier in the world. It is also a cool spot for a good strong coffee, and a toilet break!! Watch a performance by the Bolshoi Ballet. 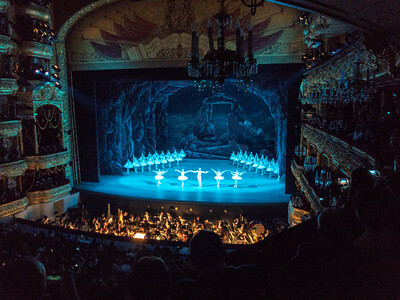 As soon as I discovered I would be celebrating one of my many 21st birthdays in Moscow, I subtlely hinted to Jon, ‘Hey, wouldn’t it be great to go and see the Bolshoi Ballet for my birthday! !” But alas, when we checked online, every show for the time we would be in Moscow was sold out. The Bolshoi Ballet is one of the oldest ballet companies in the world, founded way back in 1776. 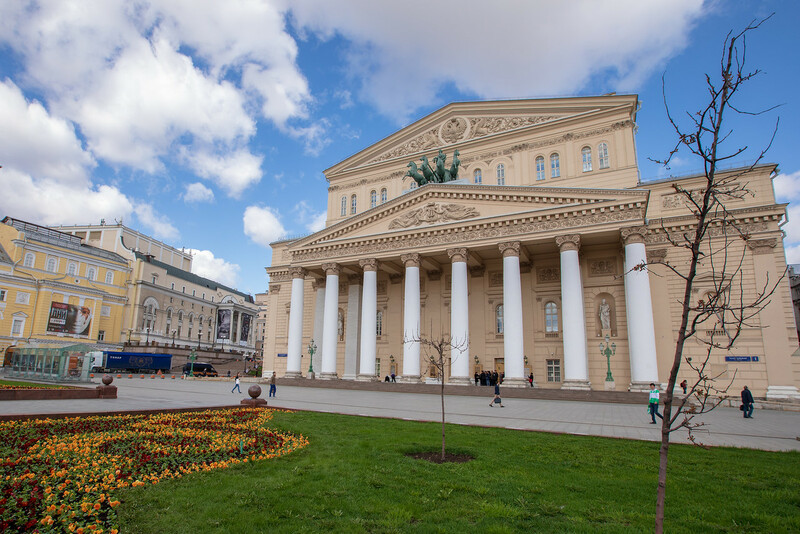 One morning as we were strolling passed the beautiful Bolshoi Theatre which was just a five-minute stroll from where we were staying, we mentioned to our guide Elena from Strelka Travel, how we would have loved to have seen a show but everything was sold out. Out came her phone and about 10 minutes later, we were sitting next to a very dapper looking gentleman choosing seats for the next night’s show. Tickets weren’t cheap, but not much more than what was advertised online, I don’t know the exact price as it was a birthday present from Jonathan, but I think you are looking at about 150 euros a ticket. We had seats up on the third tier but still got a great view of the stage. We saw the show La Bayadere, at first not being as cultured as we would like to be, we were a bit confused by the storyline but as soon as we read the synopsis, we were good, and the dancing was superb. My legs and feet ached the next day, I guess subconsciously I was trying to join in with the dancers. Read the synopsis of the show before the performance starts. The dress code isn’t too strict. Yes, many people were in formal wear, so dress up if you want but equally wearing jeans is just fine also, phew that’s a relief! If the theatre says it’s full, there are ways and means to get tickets, that’s where travelling with a company like Strelka Travel comes in really useful. 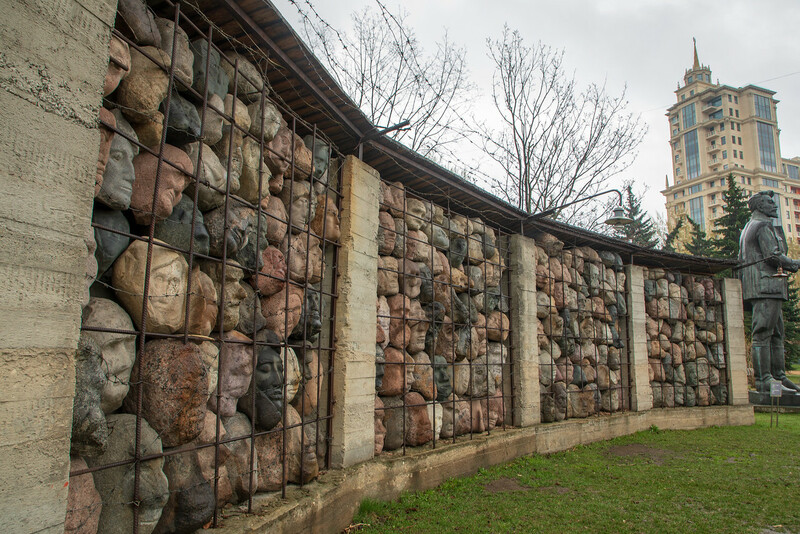 Situated close to Gorky Park is the oddly fascinating Muzeon Park of Arts or as is it sometimes known, the Fallen Monument Park. This is where many of the Soviet statues removed unceremoniously from Moscow’s parks, and squares ended up after the collapse of Communism. Here you will find a massive statue of Stalin with his nose missing, many damaged busts of Lenin no longer on their pedestals, a statue of Dzerzhinsky, the founder of the KGB and many other weird and wonderful sculptures. It’s really quite odd but well worth an hour or so to wander around. Close by is another very interesting and unique statue, it’s massive standing at 94 meters tall. Ís it Peter the Great or is it Christopher Columbus? According to our guides, this statue was originally built with the head of Christopher Columbus and is standing on a Columbus ship. The artist Tsereteli could not find a buyer in the USA, so he replaced the head with that of Peter the Great and tried to sell it to St Petersburg, but they didn’t want it either. So the weird and wonderful Peter Columbus statue remains in Moscow. It’s not the most beautiful statue you’ll ever see, but it certainly stands out! This is one of the most delightful art galleries I have ever been to. 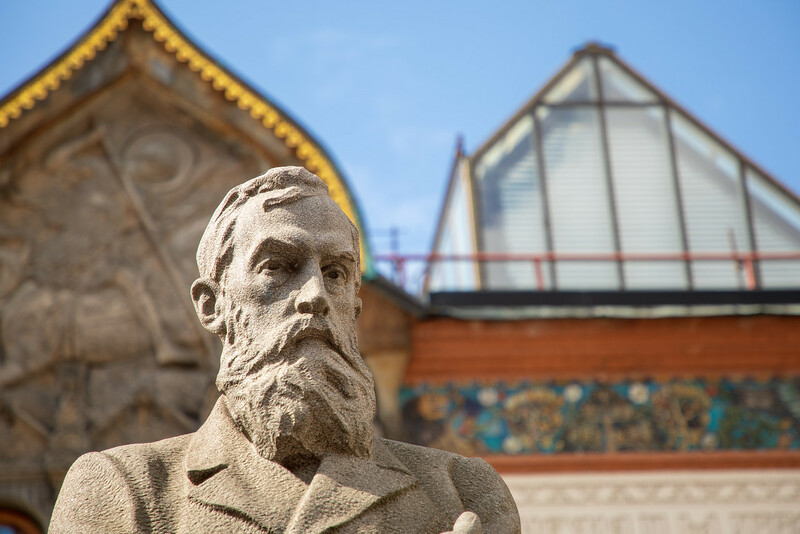 The Tretyakov Gallery holds the most extensive collection of Russian art in the world and exhibits Russian artwork from the 11th century to the early 20th century. We particularly liked the paintings of landscapes, they looked like photographs, they were gorgeous. The founder Pavel Tretyakov apparently started collecting art from local artists in 1850 and presented his collection to Moscow as a gift in 1892. It’s quite an extensive gallery with 62 themed halls and over 12,000 sqm in the main building so, like many galleries, it’s impossible to see everything but well worth a visit and the signage and descriptions of the paintings is written in English. Cost 500 Roubles per adult (approx $8), free for under 18s. I don’t think we have ever seen so much fresh food as there was in this farmer’s market. It was incredible. 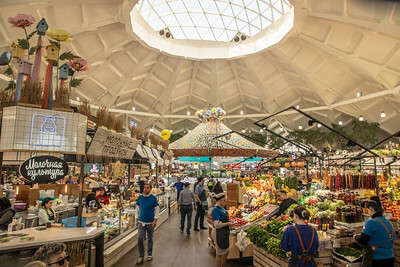 Massive displays of organic fruits, vegetables, meats, nuts, pickles – all beautifully presented and with lots of opportunities to sample the goodies before buying. Just my kind of market. We left the market with bags of cheese, nuts and interesting Russian delights that we had no idea what they were, but they tasted good! Around the edge of the market were a number of stalls selling ready made food – the queues for Vietnamese Pho were extraordinarily long but there were many fabulous cuisines to choose from – Indian, Israeli, Cypriot, to name a few. Certainly wasn’t expecting to see this in Moscow. This city becomes more and more our favourite every day. For more information about travelling the Moscow Metro – see here! Getting around on Moscow’s metro is cheap, safe and really easy to use. Tickets are only 50 rubles per ride. You can use the ticket machine, which unlike those in Lisbon, Portugal are really easy to use or buy at the ticket counter. Most staff we came across spoke some English if they don’t, then just smile and indicate the number of tickets you need using your fingers! Or learn some basic Russian, but for some reason, we could never remember how to say Russian numbers! But the best reason to travel on the metro is to see the stations, they are stunning, yes bring your camera with you but not a tripod, for some reason they didn’t like that. 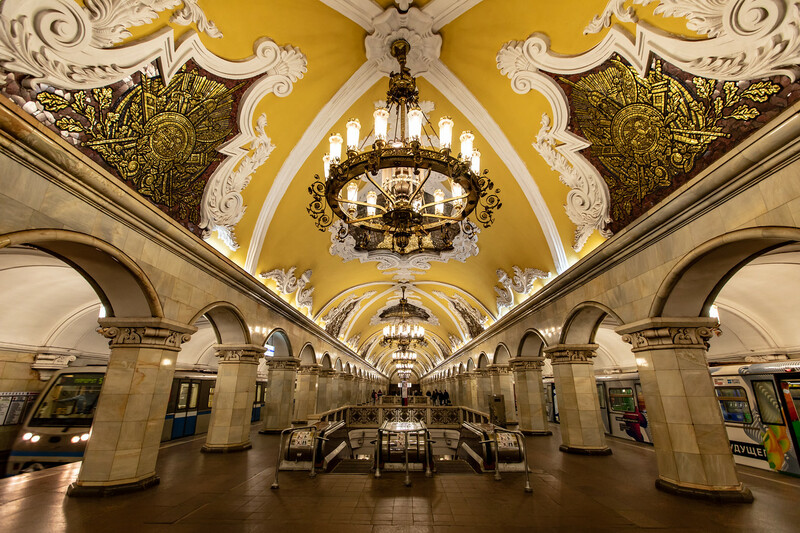 Described as “palaces for the people,” the stations are stunningly ornate, each one decorated in its own unique way. It would be quite easy to spend an entire day just travelling from one station to the next. Some of our favourite metro stations to see in MOscow include Prospekt Mira, Belorusskaya, Mayakovskaya, Mayakovskaya and Komsomol’skaya. 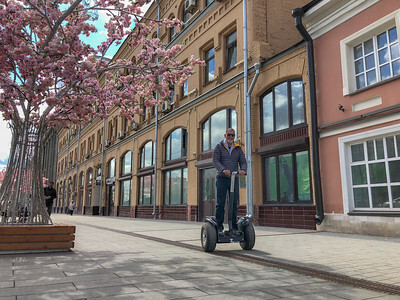 If you get tired of walking but don’t fancy taking the metro, you could consider exploring Moscow by Segway. Because I am one of the least coordinated persons in the world, I opted to take the photos and video, but Jonathan had a great time zipping up and down Moscow’s streets. This is an excellent market for all your traditional souvenirs and Soviet paraphernalia. 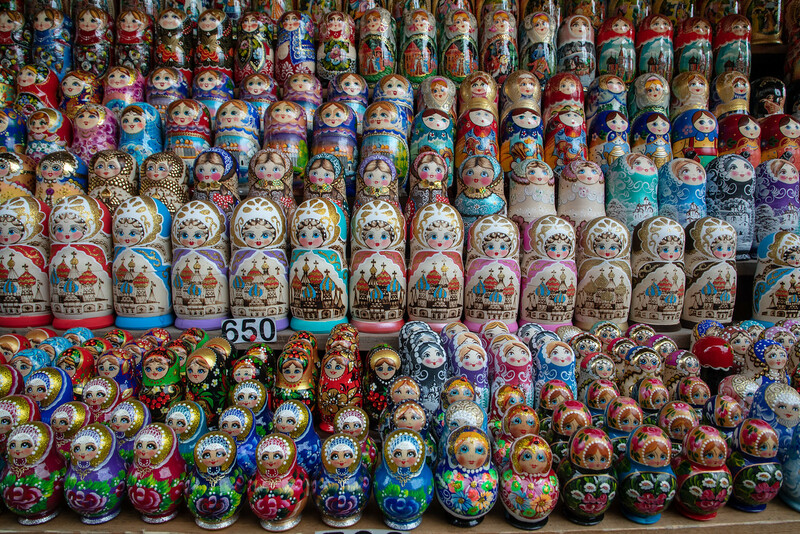 Allow a few hours at least to explore the market, it’s enormous, and you will come across some fascinating items from Soviet times, some great bargains on the Russian nesting dolls, and just so much more choice. Much better than what’s on offer at Red Square. Many of the sellers speak excellent English and are really keen to show you their products but without the hassle that you get in some markets around the world. There’s also some nice and quite reasonably priced barbeque eateries. The market is located in the Izmailovo Kremlin, a wedding, cultural and entertainment complex that is based on 18th-century Russian architecture. It’s equally tacky and fabulous, we loved it. As well as the flea market and the souvenir market, there are museums such as the Museum of Russian Vodka and the Museum of Russian Folk Arts. But we skipped the workshops and museums and headed to the shops, but I’ve just discovered there’s also a Museum of Chocolate. How did I miss that? 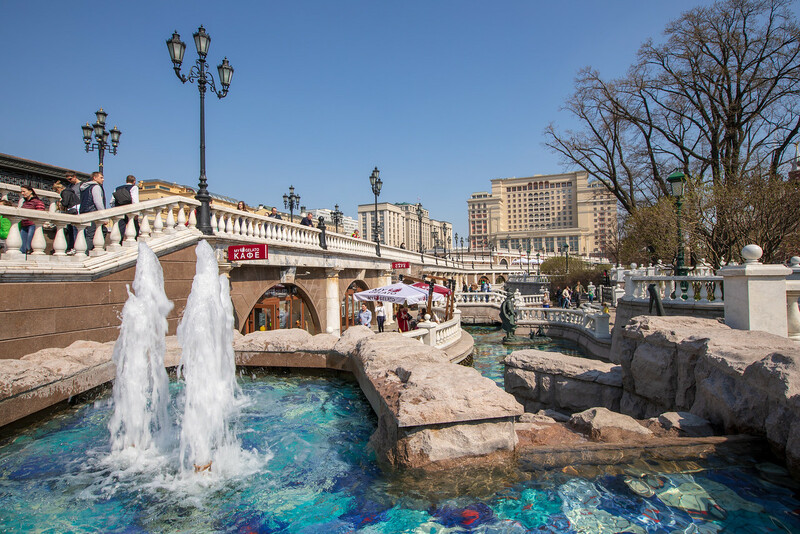 Izmailovsky Souvenir Market is Open daily 09:00 to 18:00 but more sellers there on weekends. Never in a million years did I expect to find so much choice when it came to food. It seemed like only yesterday I was watching on TV the long queues outside the first ever McDonalds to open in Moscow. We have an entirely separate blog about food in Moscow and all the delicious Russian foods we tried, but meanwhile here are a few of our favourite restaurants. – a small cosy restaurant located close to our hotel on Stoleshnikov. Serving delicious homemade pelmeni (stuffed dumplings), and venegret – a salad made with beetroot, carrot, and potatoes. We went here for my birthday, ate far too much, but everything was oh so good! It is located close to Red Square in the National Hotel. The menu includes many traditional Russian dishes. As we were not that familiar to Russian food, we said yes to everything and tried a little of each. This was indeed not the “grey” tasteless food I remember from my first visit to Moscow. A Georgian restaurant. 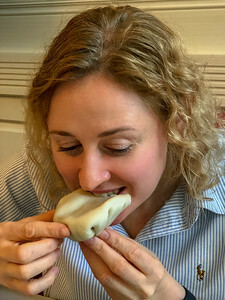 Several people had recommended we try Georgian food. We had no idea what to expect, but we love trying out new cuisines. So on our last day, Alina from Strelka Travel introduced us to this place and guess what, the food was terrific. Pancakes, dumplings and so much more made with the freshest ingredients. It’s great having lunch with someone who knows what to order. Looks like Georgia has just been added to our future travel plans! We were lucky that within the vicinity of our hotel Akvarel were loads of bars and restaurants. It was a superb location. Another great area for eating out is Patriarch’s Ponds. Easy to get to with an Uber, it’s quite an affluent part of Moscow with some great bars and restaurants. Not very Russian but we had a lovely pizza there! Well if you have made it this far, congratulations. What can I say? In case, you hadn’t realised Jonathan, and I really loved Moscow. If you are thinking of visiting Russia, do allow time to visit Moscow. Yes, you will need to get a visa, but it’s really not that difficult to obtain. In case you’re wondering, we felt very safe walking around the city at all hours of the day. Use the metro, it’s cheap, it’s easy, and it’s beautiful to look at. Taxi drivers don’t speak much English but getting around by Uber is really easy and surprisingly cheap. Most people, certainly those in tourist areas, do speak English. Learn a few words of Russian, the locals will appreciate it. 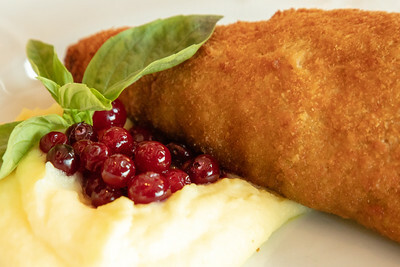 Try some of the delicious local Russian cuisines. Stay at least three nights, we stayed four. It wasn’t long enough. In fact, stay as long as you can. We hope you enjoyed our guide for what to see in Moscow, if you have any questions or comments, please let us know. Disclaimer: Our trip was partially sponsored by Strelka Travel, but all the reviews and opinions are our own! Russia has been so far down on my radar, but after reading this, I think it just moved up a couple of ticks. Moscow sounds so interested and I would love to see the ballet. We were pleasantly surprised as well. It definitely made me see Russia differently. Interesting trip. Yes, you must put Moscow on the list. It’s an amazing city, we can’t wait to visit again! Russia has been on our bucketlist but your pictures inspire me to make the trip right now. There is so much of history and culture to be experienced there. It’s a great place to visit. You really must visit if you get the chance! Great to read your experiences. Such a welcoming country Russia and so much to explore. Good to know here food is also delicious. I’m loving every architectural design, and special love to the colorful St Basils Cathedral. LOVED reading this because, like you, I also visited Moscow in that same era, I think was 1991, and yeah it was grey and ugly and the food was godawful and the queues for basics in the shops, shops that were three quarters empty shelves, was shocking. I loved it even then, though, so I’d LOVE to go back now. I’d miss all the black market shopping, and getting blackmarket tickets to the Bolshoi for £2, but I’d love the much improved hotel choices and restaurants, oh my god, decent food! Plus I’d love to revisit the metro stations and historical sites as well as that food market, oh my! Though we have never visited Moscow, it has always been a source of fascination. This mainly because of the rich diet of epionage novels about the cold war. But Moscow seems to have come a long way from those times. The Kremlin and St. Basil’s Church look so breathtaking. But the builing that housed the KGB headquarters has its own morbid satisfaction. Wow! Moscow looks incredibly beautiful. The iconic buildings and the architecture of the city is simply stunning! My favourite one would be St Basils Cathedral. It looks so lovely, vibrant and a great example of architectural excellence. The Moscow Metro Station is pretty impressive. It doesn’t look a metro station. No wonder they call it ‘palaces for the people’. Thanks for sharing the detailed guide. Moscow definitely sounds like a bucket list destination. I am truly inspiredto visit Moscow after reading your descriptive recommendations. I also intend to visit St. P of course. As a single female traveller, I have concerns about cost and safety. Any tips you can offer would be appreciated.